It’s December, and in keeping with the season, I had planned on a post celebrating Robert Frost’s poem “Christmas Trees”. Instead, however, I found myself on an inquiry path on a Frost holiday tradition. I first inquired, what is the story behind Frost’s poem Christmas Trees? A slideshow of the cards is available on the NYTimes website. This tradition continued for another 30 years, and the Frost-Blumenthal productions were holiday “greetings” in the form of chapbooks. I then needed to inquire, why a chapbook? I discovered that a chapbook was historically “a small pamphlet containing tales, ballads, or tracts, sold by peddlers” in contrast to its current contemporary meaning, “a small paperback booklet, typically containing poems or fiction.” These chapbooks are very simple, stapled in the center, with some illustrated covers. What was the annual press run? Did the press have a list of subscribers committed to buying a set every year, and how much money did Blumenthal and Frost eventually make off of the limited editions? I did find out on the Poets.org site that Blumenthal printed 275 copies of the first greeting, and the last, “The Prophets Really Prophesy as Mystics, the Commentators Merely by Statistics” had an edition run of 16,555 copies. There was no collective information on the money exchanged, other than the note that the cards can sometimes be found for purchase on E-bay (example). That led me to inquire, what other poems did Frost place into chapbooks? The video ends with a copy handwritten by Frost of his poem “Stopping by Woods on a Snowy Evening”. This inquiry led me a different publisher. Frost’s Snow to Snow, was issued by in 1936 by Henry Holt & Company. 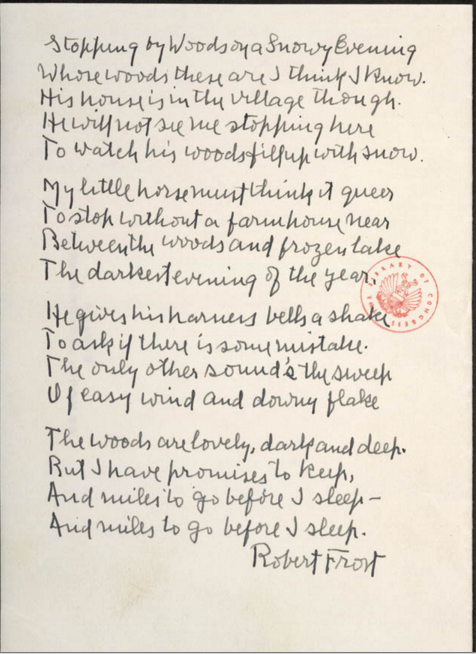 They published twelve of Frost’s verses, each one corresponding to a month of the year and ending with December’s “Stopping by Woods on a Snowy Evening”. So how does one find out what the poem “Stopping by Woods on a Snowy Evening” means? I then decided to chase down the popular story (one that I have often repeated without checking its veracity) that Frost was in the audience of group of people listening to a lecture about the meaning of this poem. As much fun as that rumored story is….I could not find anything to confirm it happening. I am chagrined that I have kept the rumor going. 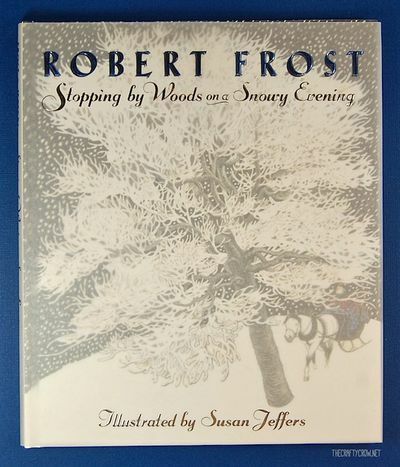 My final thought on Frost’s poem “Stopping by Woods on a Snowy Evening” was of the picture book illustrated by Susan Jeffers that I read to my boys as part of our holiday preparation. The man in her rendition bears a striking resemblance to Santa Claus and the little harness bells look very festive. I know Jeffers makes the poem more child-friendly than alternative interpretations! You’ve often heard me say – perhaps too often – that poetry is what is lost in translation. It is also what is lost in interpretation. That little poem means just what it says and it says what it means, nothing less but nothing more. Therefore, on this post I offer no translations…and no interpretations. Here are discoveries-and at least one correction- on my inquiry journey of the winter poems of the aptly named Frost.